This website went online March 1st 2007. All future additions are shown here. Fill out your e-mail adres and you will get a message when I change this page. It's a guaranteed safe, anonymous way. If you find flaws please report them! 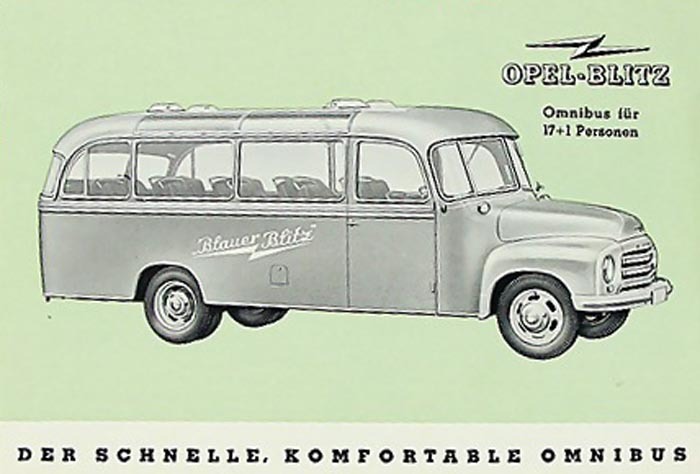 Share things that you find about the Opel Blitz bus that are not here. 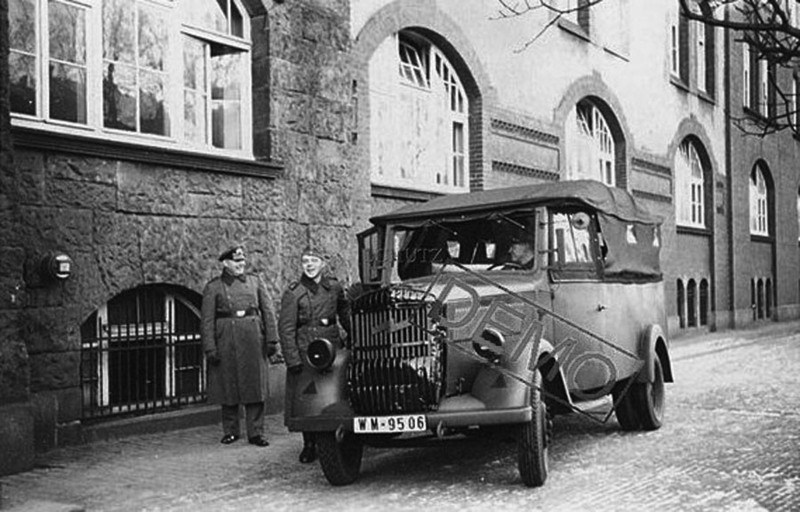 A sideview of a 2nd generation Wehrmacht version and a cartoon from a puzzle added to the Illustrations page. 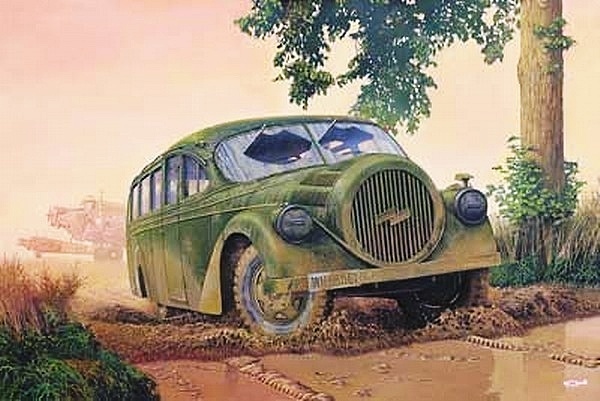 a period picture of a 1946 ATO semitrailer added. 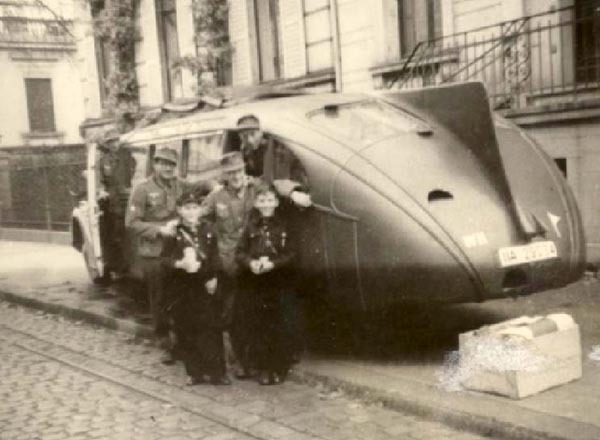 The streamliners got the first of the attention with 11 new pictures. 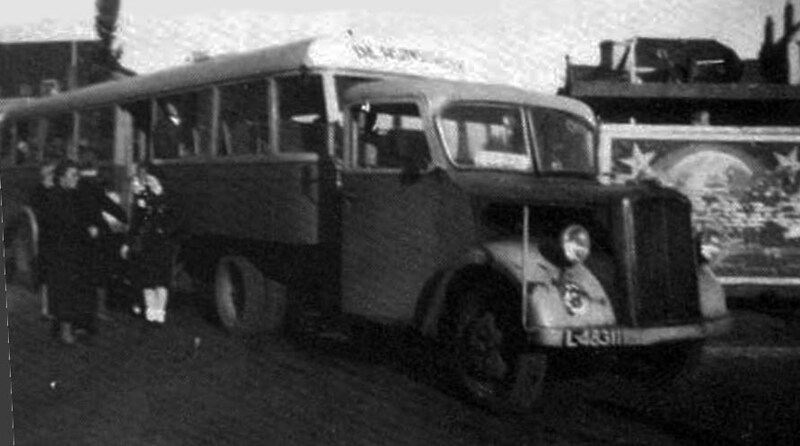 Three aditional Aero pictures of the 1st doubledecker and 3th modell. 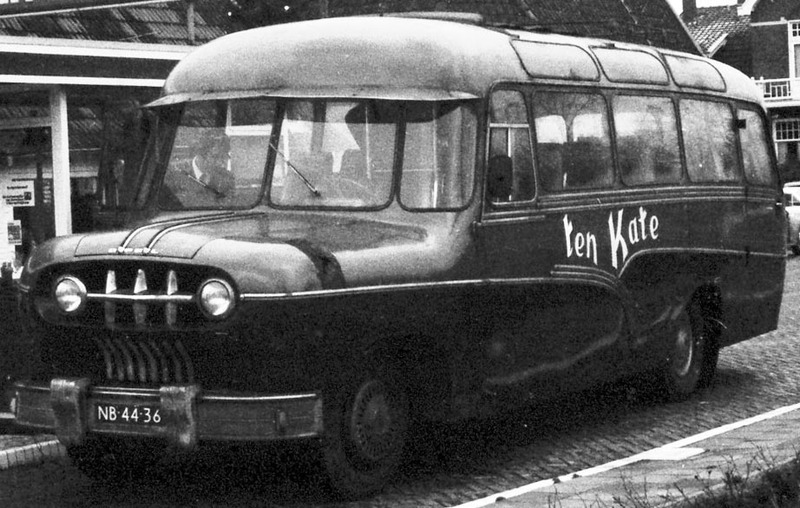 Four pictures of (probably) post war conversions: one two three four. An extra Maarse en Krone. 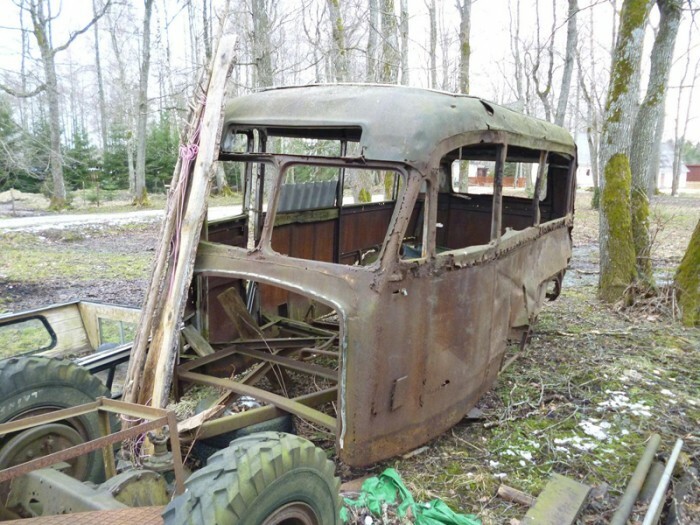 And three pictures of a 1946 conversion: one two tree. 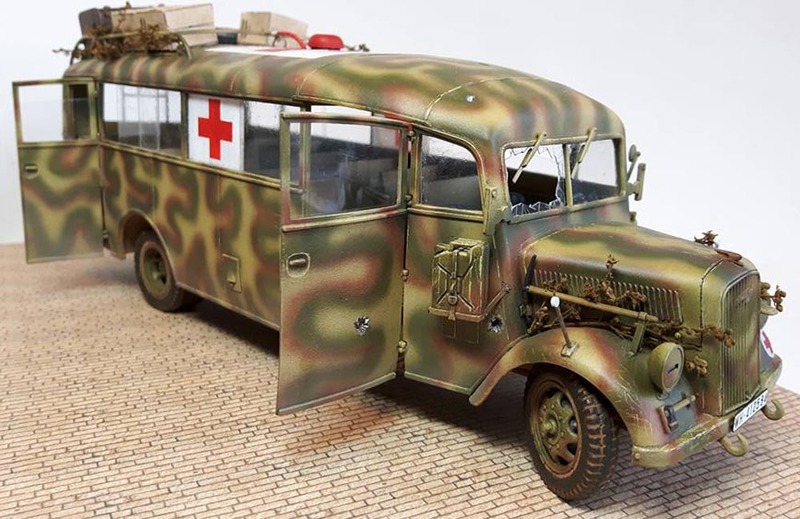 Bart de Pauw identified his Ambulance Ironside 35th in the build modell gallery and sends extra pictures. A 160th scale and a 700th scale modell in the smaller scale modells page. 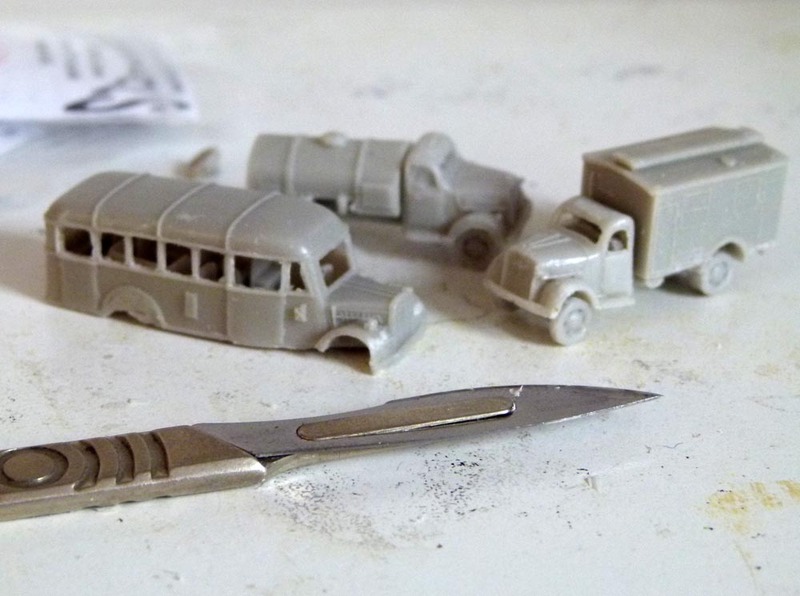 A 87th scale bus trailer and a spectacular 35th scale ambulance modell with interiour in the build modells page. Pictures and info on the A 87th scale Arsenal modells. So an addition in the with interiour in the 87th scale modells page. 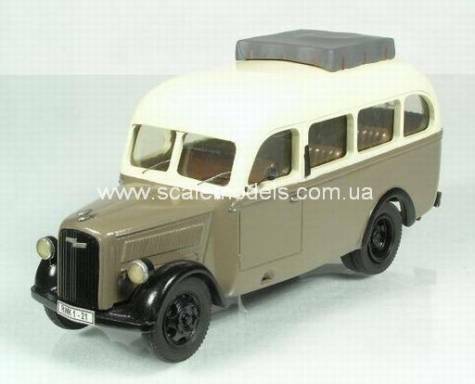 The 35th scale MR wheels added to the 35th scale modells page. 3 other modells added to the build modells page. 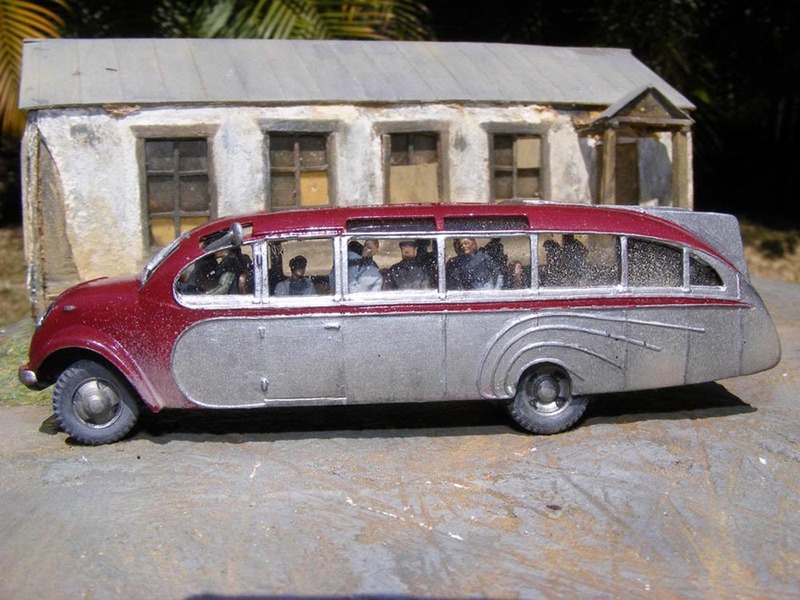 A 72th scale Aero with passengers, a 35th scale 1,5 ton panelvan and a well build Roden 35th scale by Andrew Tomlinson. 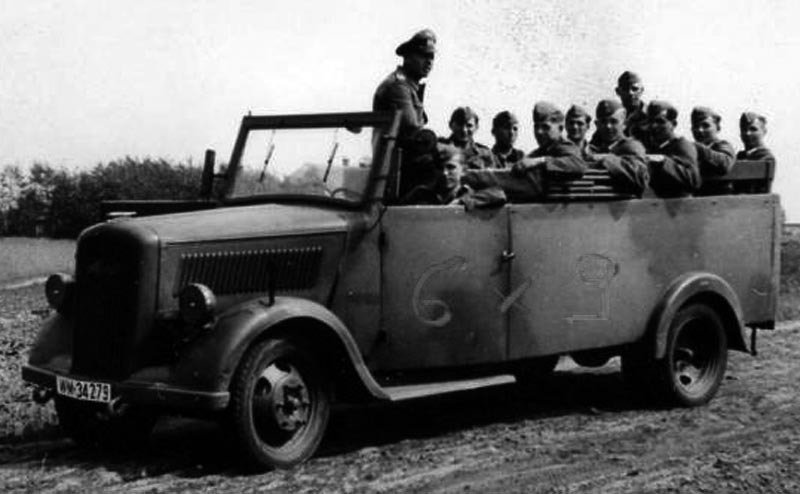 After the last update and a passionate discussion on Missing Lynx, Illian sent me pictures of a splendid 72th early Wehrmacht bus in a May 11th 1940 setting. The last update also got the attention of Trevor Claringbold. He made me aware of 3 special bus versions of Landmark in 76th scale. A bakery bus, and two 1,5 deckers ( a medical and a church version)! Unfortunately there is no information on where these very special versions are based on. 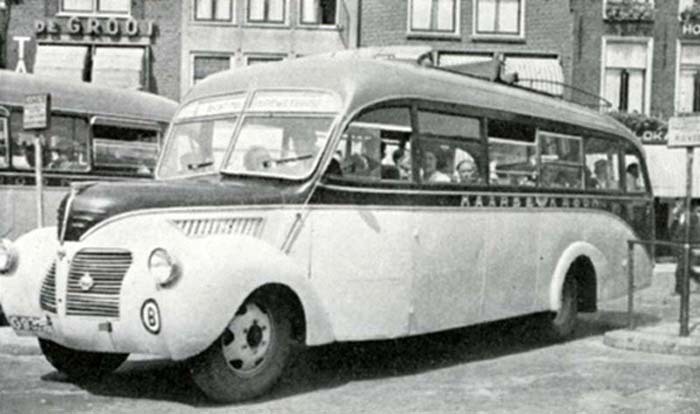 I finnaly got beter pictures of one of my absolute favourites: the 1938 Utrecht liner by mr. Steenmeijer. Adding and comparing info made changes to the specials and modells pages. 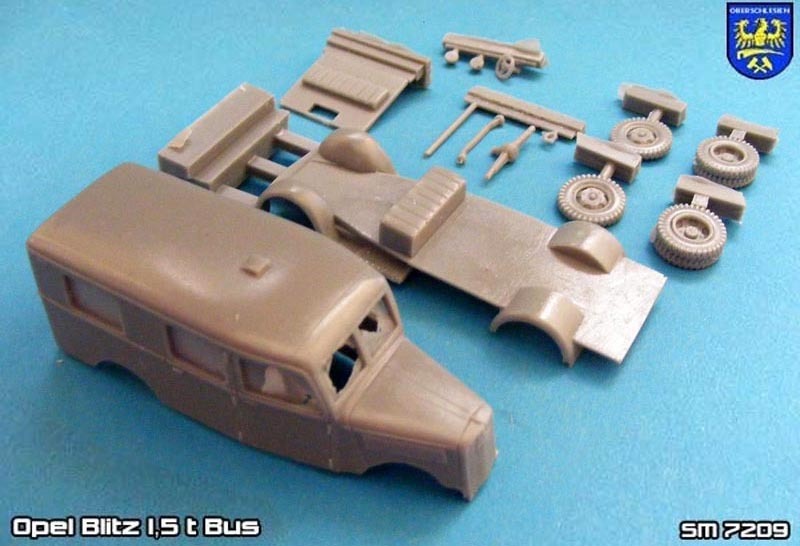 A new resin kit of an early Blitz bus. 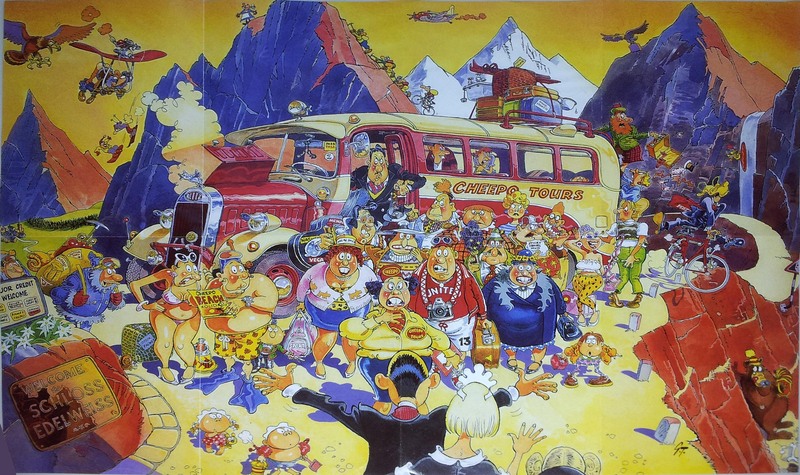 See Henk's page for a staggering display of his products, or buy them here. Sifting thruogh all these modell pictures I rearanged the build modells page. With all these nice Roden kits, seing a build Blitz bus is not rare anymore. I'll only add what is really special in type, idea of detail. (No worry, I keep all the old modell pictures.) Ow, and don't throw away your old modell's. I'll grant them sanctuary if they must go somewhere! 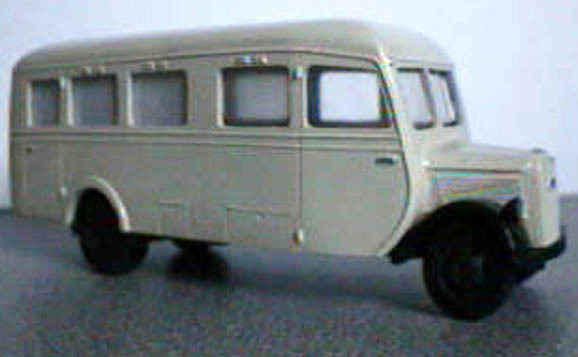 An 35th scale ambulance bus with a correct interiour. A Mad Max Blitz bus. And last in this round up of new information, pictures of survivers. Every time I promise myself I'll save the place they came from to credit the people and sources. And again I've lost a lot of them. Sorry! If you find your picture here, or your vehicle, please tell me so, so I can propely credit them and link to your website. It's a lot of them, so I bundeld the new ones here. Biggest news in a long time: See Duncan Ross Nicholson (director of Tanks 4 sale) pictures of his trip to Sofia, Bulgaria. 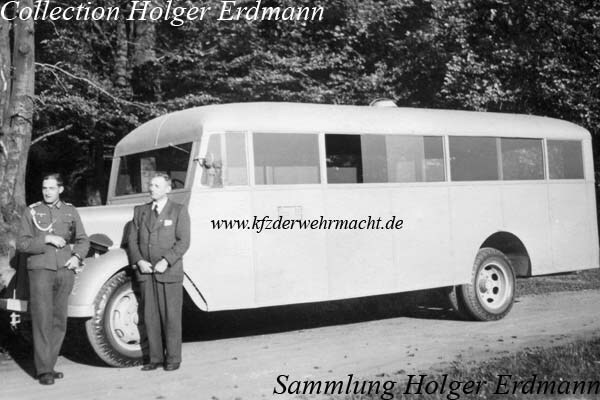 The closest thing to a Wehrmacht bus ever. And again, amazingly, several new period pictures (See here what's been added) And they all got their place in the pages. Two new illustrations: a chassis programm add and a Roden Aero boxart. Two new drawings: a 1.5 ton Coach line drawing and a Aero streamliner seating arrangement. 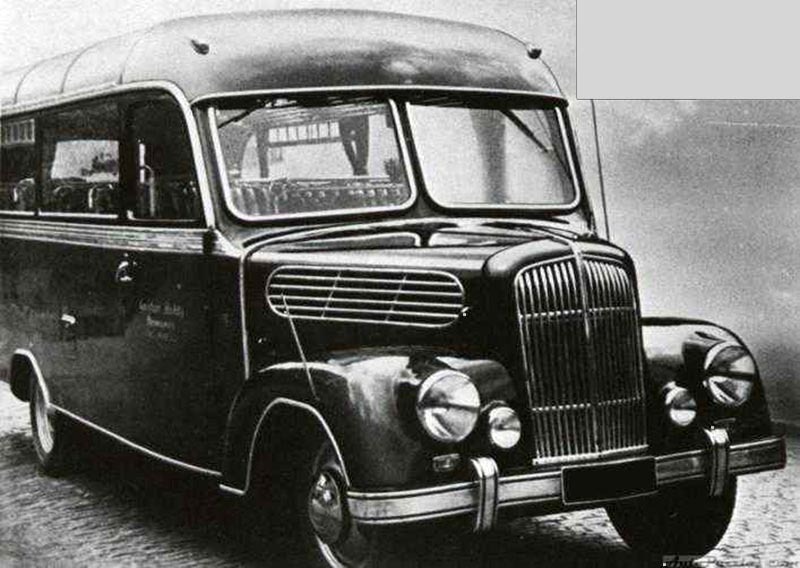 Exact info on the Brilon cabrio-bus / windowless-bus . 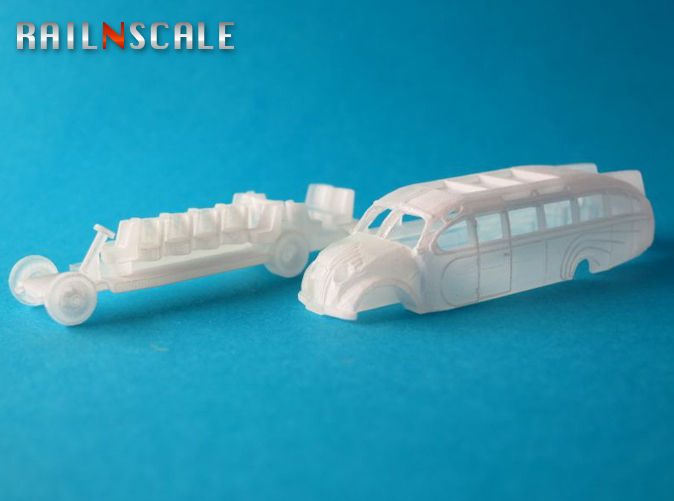 Sprue of the 72th scale Roden Aero bus . 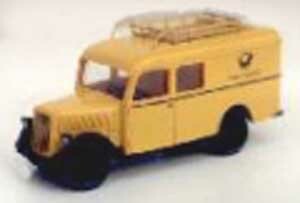 A Strassenzep in N-scale (1:160) came available from Rail n Scale. 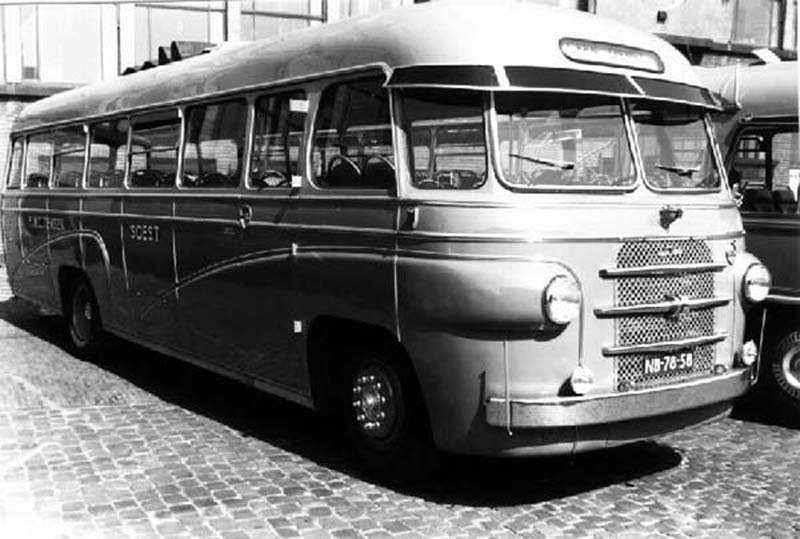 Alexander Glorieux himself forwarded info on the small bus and limo coachworks. 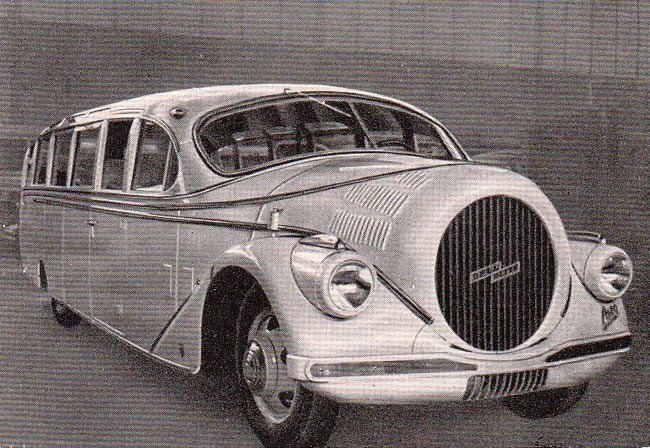 They are the 1947 work of coachbuilder "Harmening"
Some housekeeping and the new Ludewig info has been worked into the website. 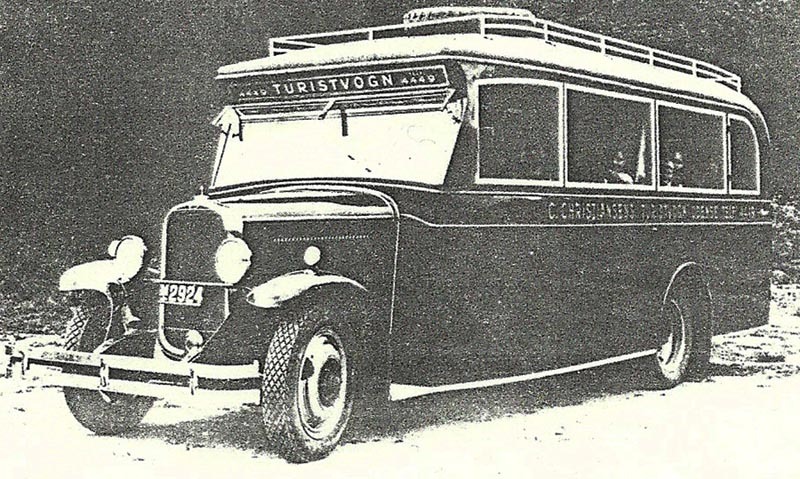 From the Commercial Motor archive an article on the Bussing doubledecker. Alexander Glorieux sends (postwar? 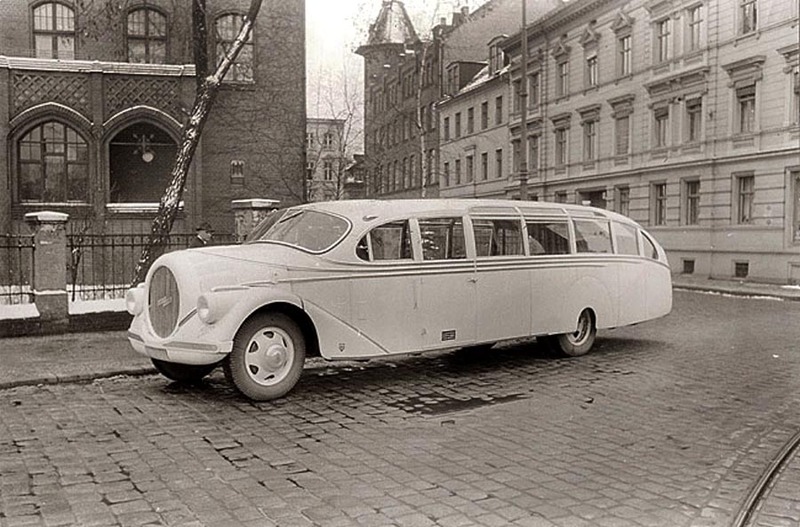 )pictures of a small bus and limo-like coachwork on a 1.5 ton Blitz. Who knows more? 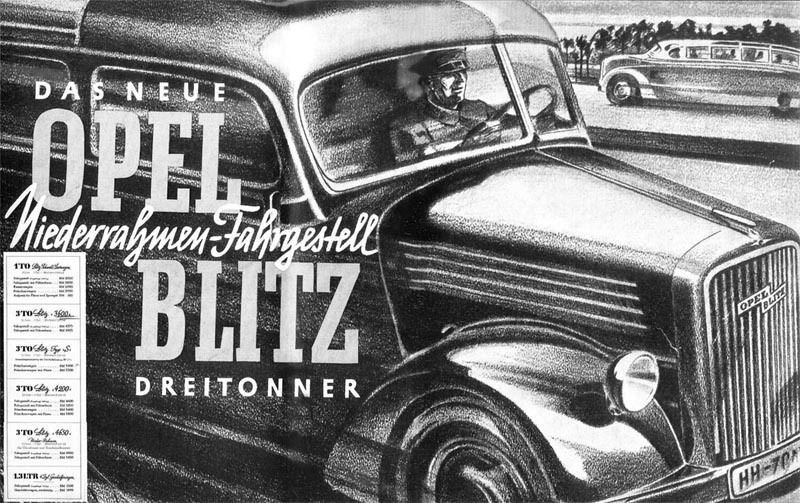 A sales brochure of a 1955 1.75ton Weichblitz by Gl�ser. A major find in info, the Ruhr Museum Archive has a extensive collection of pictures made for Ludewig. Finnaly! 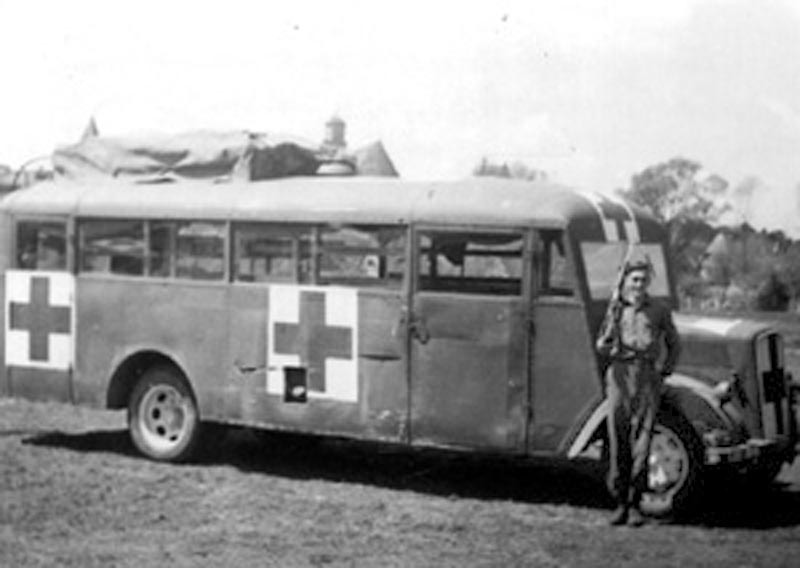 another 2nd version Wehrmachtsbus seen in 1944 with 2 people from the magnificent site of Holger (kfz der Wehrmacht). Tables with the licenceplates of Germany and the Netherlands. 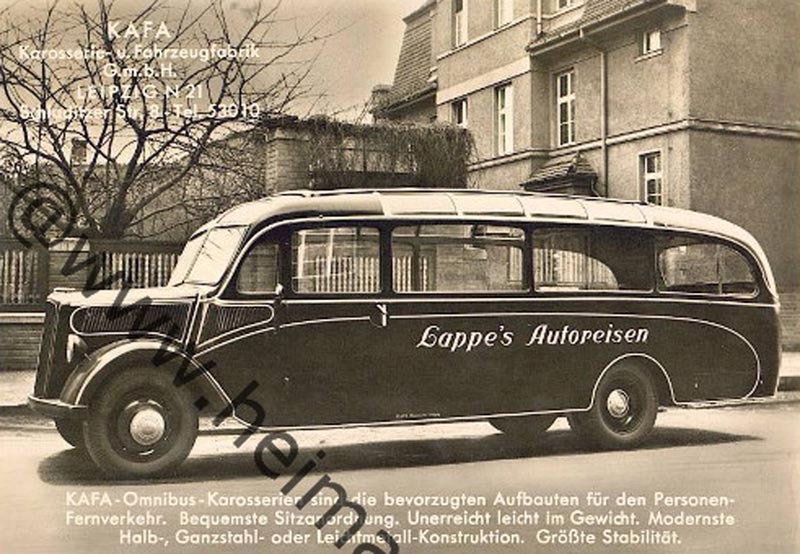 Another KAFA promotional picture of a 1937 liner added in the 5 window page. An Auw�rter early version added in the early Blitz page. A good interiour shot of one of the nice Roden kits added in the kit723 page. 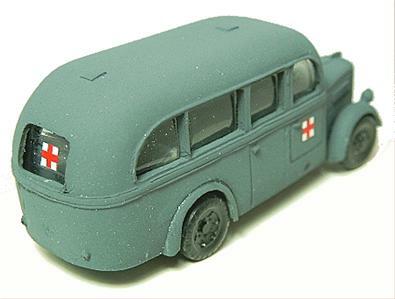 A picture of a round 1.5 ton 87th scale ADP ambulance on Ebay> added in the 87th scale modell page. A new page with info on the explotation in Osnabr�ck, with 3 pictures of an early, a 1,5 tonner and a 3 tonner. Also pinpointing a nice picture in the 5 window page to it's origings. The info on Aero and Ludewig got some extra facts. 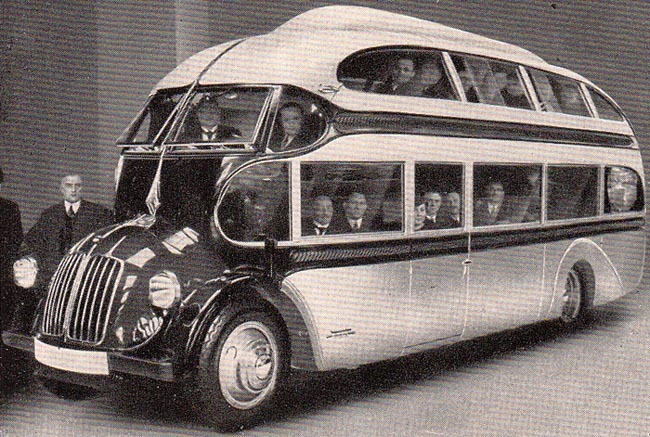 Turns out that the Aero doubledecker has a B�ssing-NAG chassis. The semi-trailer page is the first to be updated with the new pictures. A drawing of a Ju52 sanitarian plane's interiour would give a fair idea of the interiur of an ambulance bus. In the survivers page, two riddles are added: A mysterious Danish surviver and a bare hull. Any idea anyone? (See the questions page for a little more info. 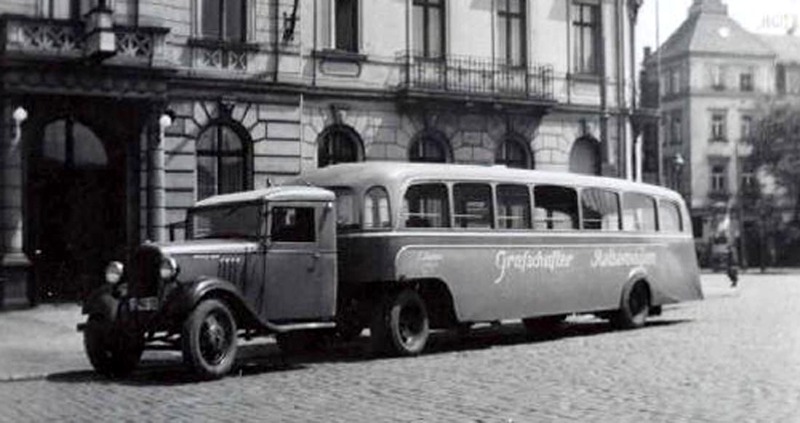 A 72th scale Danish bus with a gasproducer by Christian Papeleux. In the 1st Wehrmachtsversion 33 pictures are added. I've reshuffeld them. The page period pictures holds all. Many other pictures added. If you want to know what's new, see the Added page. They all wil be in the pages that they belong to, but for today it's done. 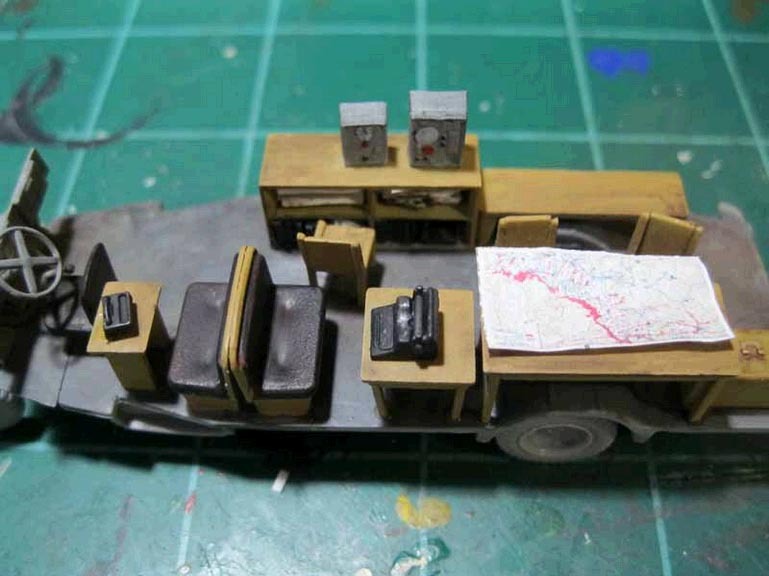 An amazing scratchbuild 72th den Oudsten GTU bus build by Alex from Moscow. The Roden line of 72th modell got updated. A new illustration page with a marvelous Autobahn promotion. 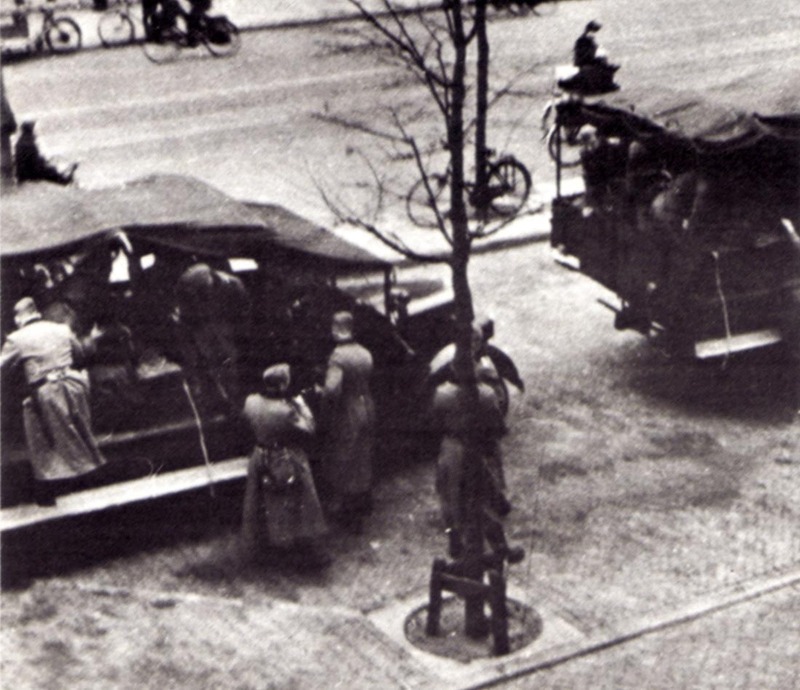 New pictures in the cabrio page with a 3 ton (possible) Blitz of the infamous gr�ne Polizei and 2 Navy "policecabrio"'s with hood up and down. Several new pictures in the survivers page. A new 1950 1.5 ton surviver and a 1938 1.5 ton surviver. 6 new pictures in the early Blitz page. 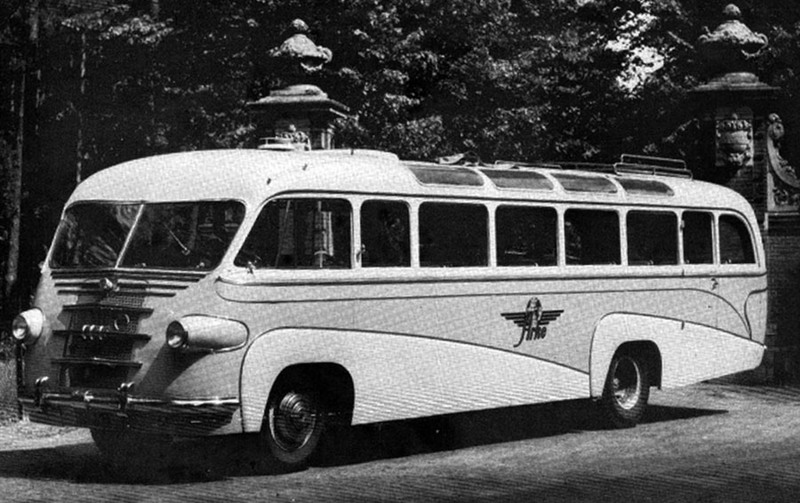 Martin Korth identified the newest Streamliners bus as a Mercedes. That would disqualify it for this website, but its so beautiful, i'll leave it on anyway. The Streamliners page got a script to browse through the pictures. Unfortunately that does not work on Apple. Mmmm. That's not nice. As a test the Interiour pictures page got a new structure. Let me know what you think. The drawings page is now "Drawings and Illustration" page with several additions. The new Roden kits got added in the 72th-76th modell page. The modells page got divided in more seperate pages. 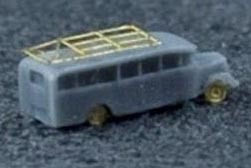 A 72th scale modell 1st WH bus by ericdu34. 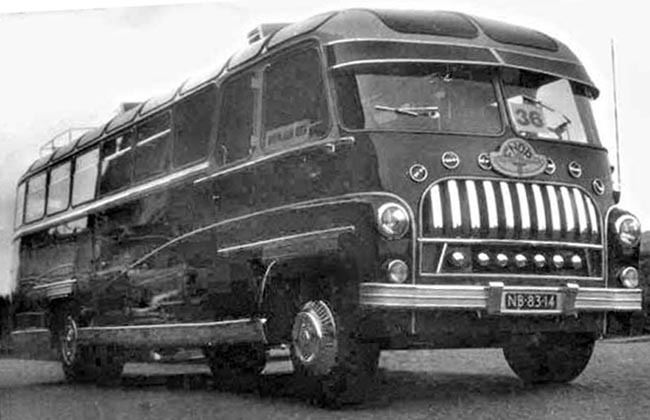 Christian Papeleux provided another picture of the Streamliners doubledecker and a magnification of the driverssection. Karroseriefabrik Gebruder Ludewig can be read on it. Many Thanks! A new period picture in the Interiour and 4 period and 4 surviver pictures in the cabriolet section. 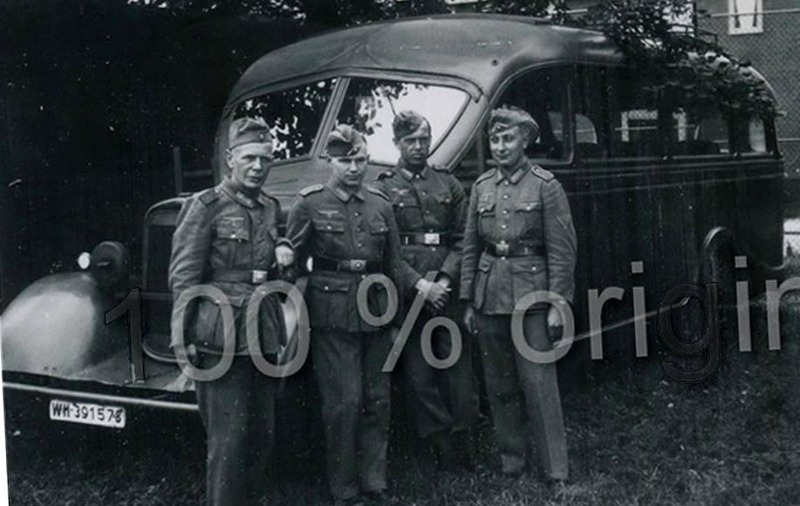 A regrouping and 14 pictures added to the 1st version Wehrmacht version. The Streamliners got their own page with some stunning new pictures. The Design page got a new picture and some reorganisation. The Specials page got a new picture and some reorganisation. The Cabrio page got a new picture and some reorganisation. A period picture of the Ludewig factory building. After the previous update it's time for the real deal: period pictures. The small brother, the 1,5 ton got it's own page with a couple of new pictures. 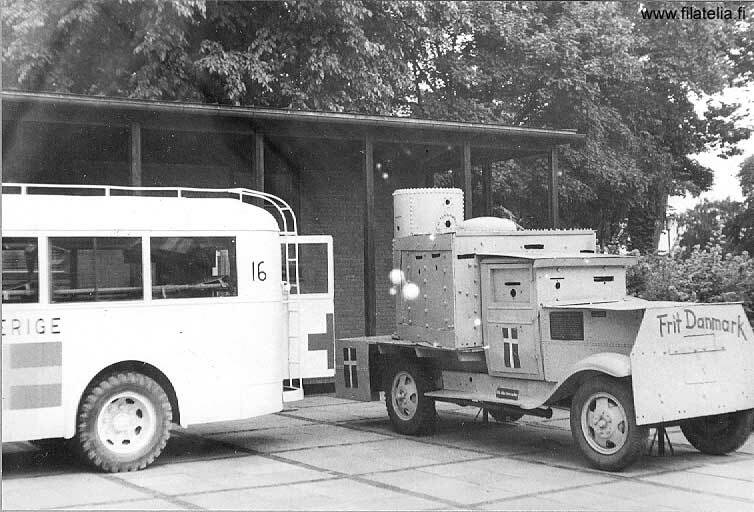 2nd version Wehrmacht ambulance guarded by a British(?) soldier. It's been a long time. Hardly any time for nice things like Blitz busses. Time for some action. 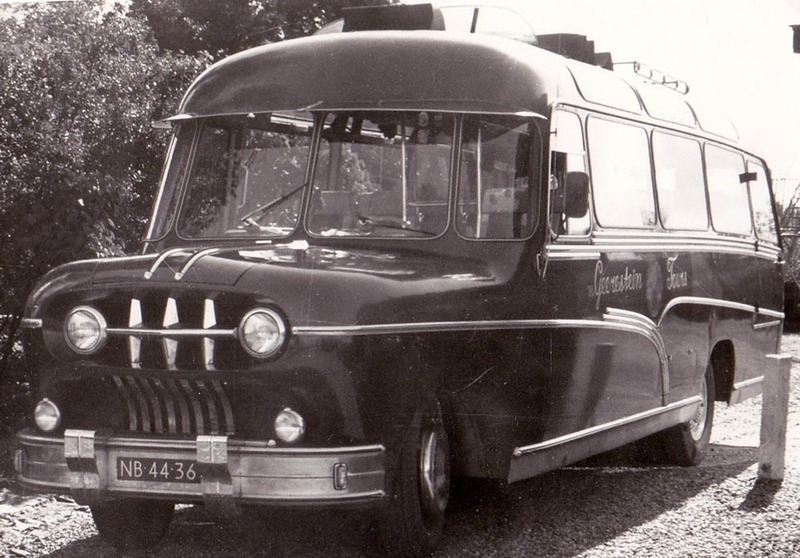 What does a "Weichblitz"-bus look like, after 40 years of wear and a lot of neglect? Like this. Right side illustration of a Hungarian 1944 2nd Wehrmacht version . 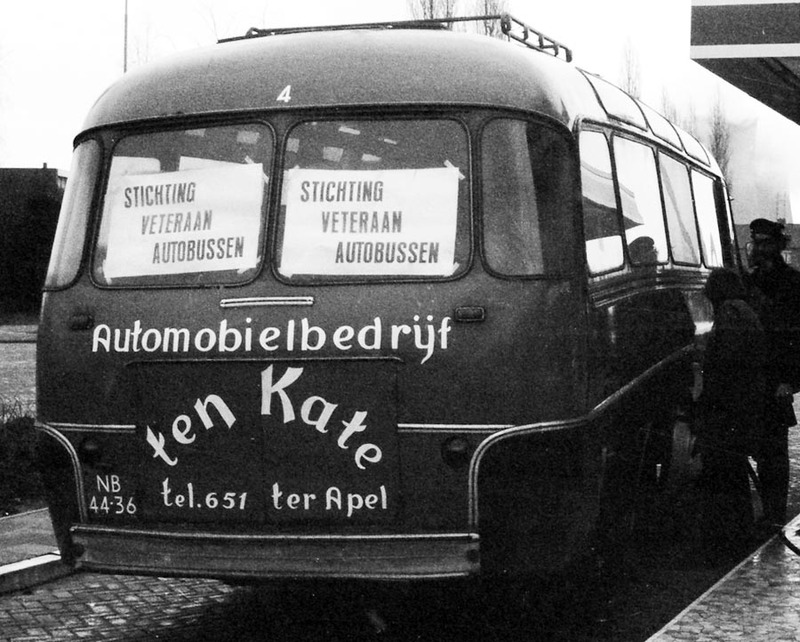 The 1,5 ton bus that was known to me as an Auw�rter, tuns out to be a Reutter. 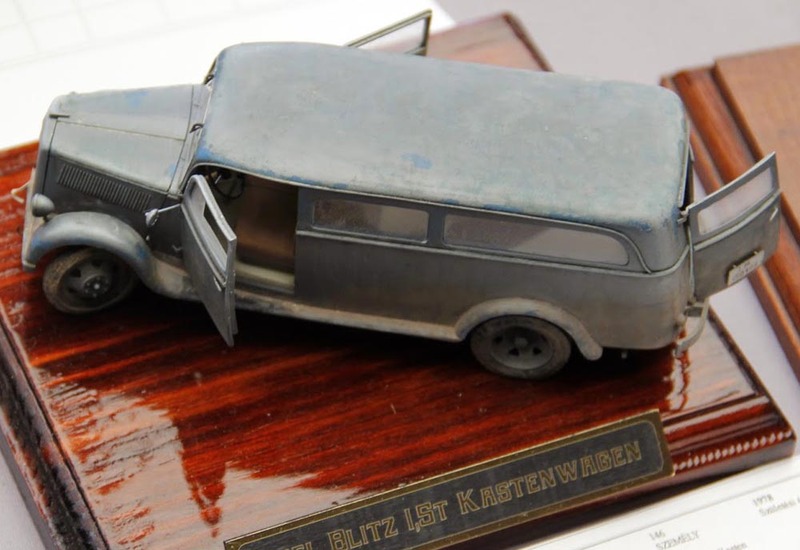 A 1/35th scale diorama of a burned out bus by Piotrek. 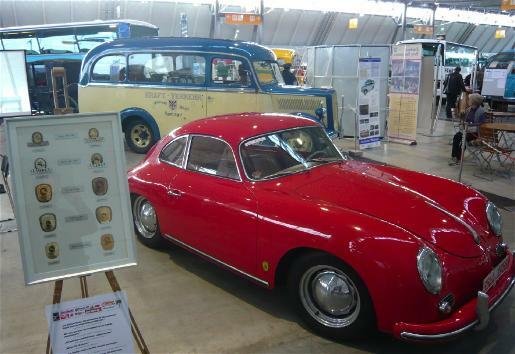 - Two new pictures of the 1938 Auw�rter (Deutsches museum). - Finally a story on the IFA surviver the Reko-Blitz. 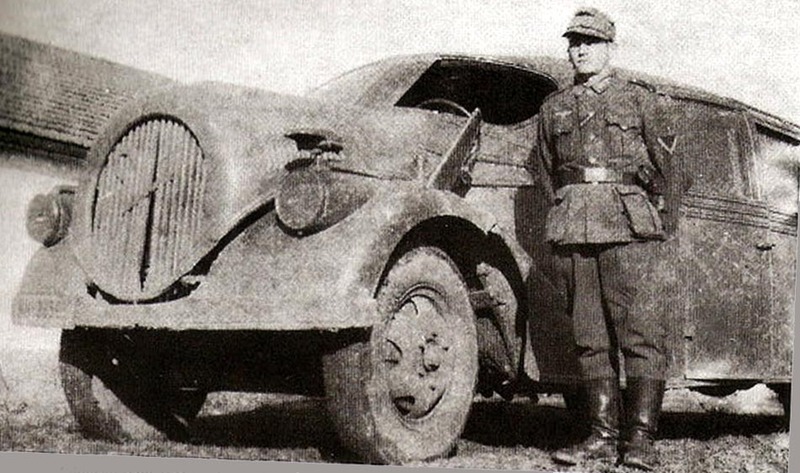 - New info and pictures on 1937 3 ton the Estonian surviver. 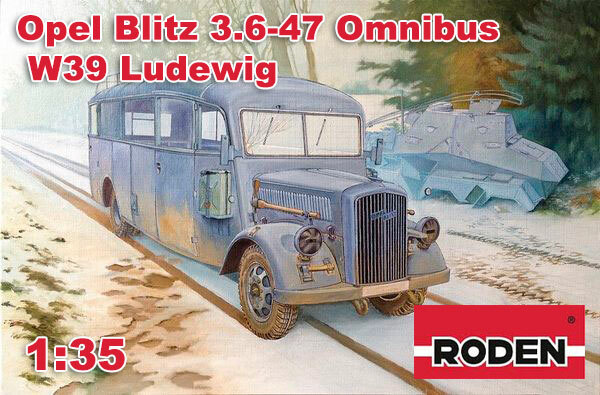 - New pictures on the 1949 1.5 ton Auw�rter. Well, I got several hundred pictures early 2009. Many Blitz pictures, some maybe's and also a lot certainly other makes. What to do with it? Well I decided to share the puzzle of these other busses with you. 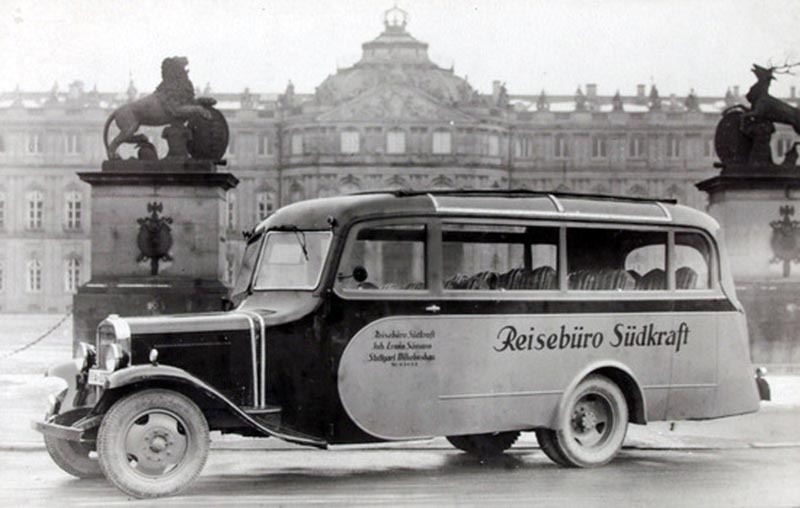 See wehrmachtbusses and be amazed as I was by the wealth of pictures people send me. It took me a long time to find the form in which I could manage all that information. But I'm back at it. 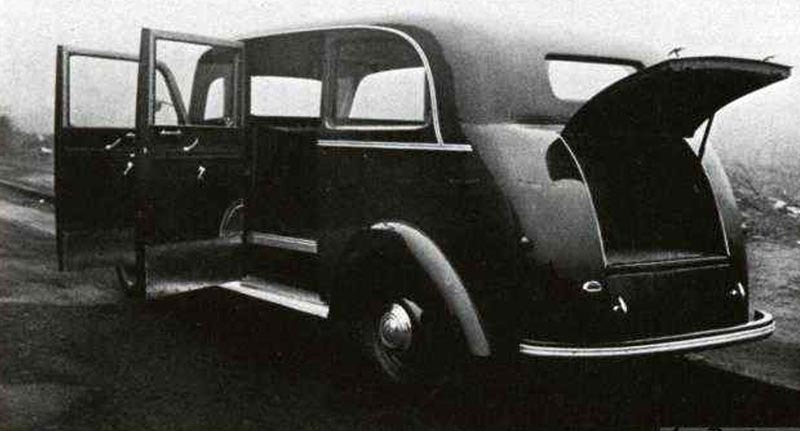 First to update is a lot of new info on the cabrio's, some models and on Ludewig streamliners. Design, COE and air stream finaly got it's own page. - Semi-trailers got it's own chapter. - In the drawings a factory chassisplan. - Interiour pictures got their own page. - More models, better classification, many improvements. - Move to a paid space.